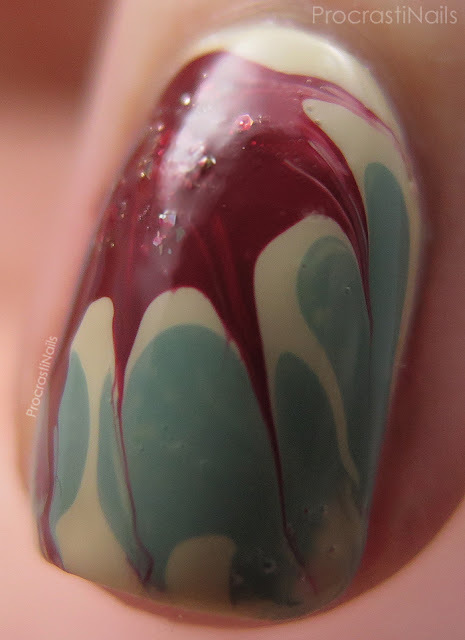 This look didn't turn out quite like I expected but I've decided to share it with you as my contribution for this month's Hobby Polish Bloggers Linkup anyway. Two things I learned from this quasi-nail fail: trust your gut, and be selective with your colours! Argh. Haha. 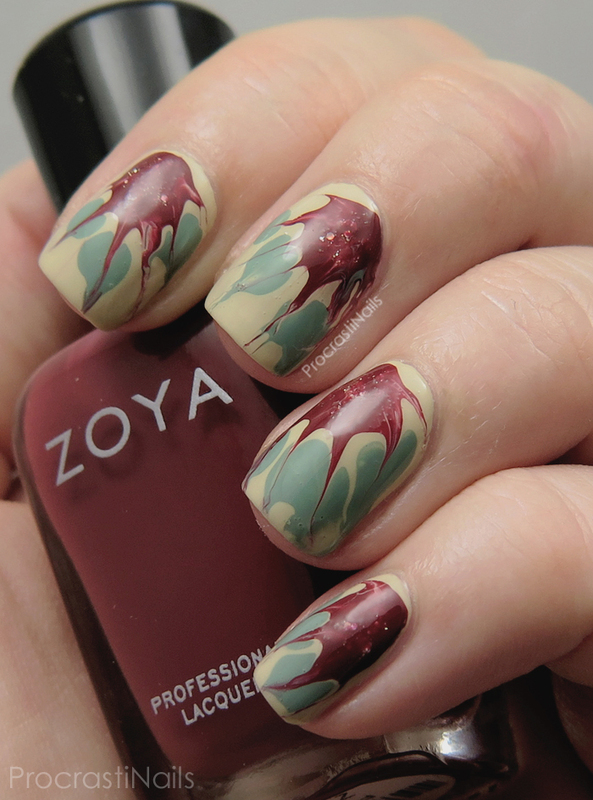 This entire look was done with Zoya shades - Zoya Charlotte, Pepper, Bar and Bevin. 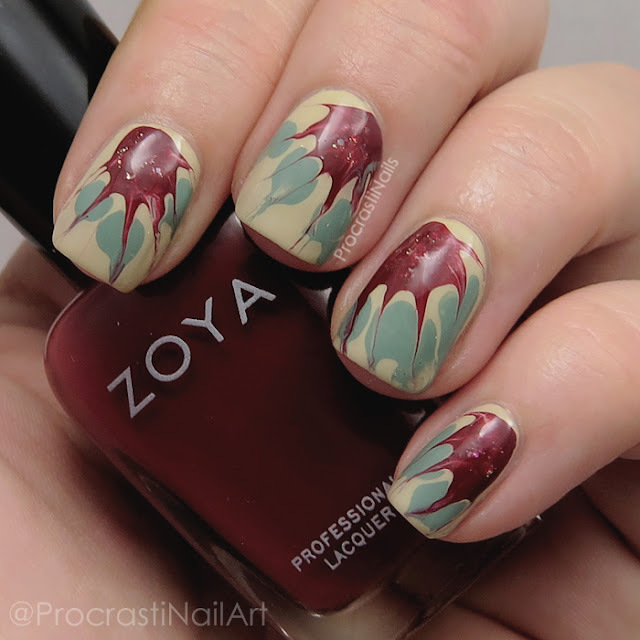 I applied a thick coat of my base and then added some blobs with my colours and while it was all still wet pulled the polish with a dotting tool to make the petals to my quasi-poinsettias. I dotted a little bit of glitter in the middle to give the impression of stamens and then covered it with a bit more of my red to soften the contrast. 1) The base colour I chose (Zoya Charlotte) is a kind of terrible eggnog yellow that dulls the whole look. I should have gone with white. 2) I should have followed my gut and left the glitter I put on for the poinsettia stamen (Zoya Bar) rather than trying to make the glitter more subtle by brushing on a bit more Pepper on top, because after I was left with a weird random peek-a-boo glitter situation. Hm. In general I don't hate this look, and hey it was my first attempt at a needle drag look so that's pretty good! If I had energy I would re-create this design to correct the issues I have with it but ain't nobody got time for that. Learn and move on! I love this! It's a controlled mess and it's right up my alley!! Fab job! I actually disagree about the base colour! The yellow tone is that Zoya gives the whole look a vintage feeling. Maybe not what you had in your mind but I think it looks gorgeous! I find the whole thing super pretty ! Even if it didn't turn out the way you wanted I actually really like it! I think it looks really cool! I love the idea you had. needle drag was hard. So hard. I really like this design and even the eggnog-y color you chose. Not bad at all! I love how abstract this looks, and your needle drag looks great! I really think that for a first attempt this came out wonderfully! My first tries with needle dragging were horrible, so I admire this! I agree with Deborah, the abstractness is awesome. It may not have turned out the way you had intended, but from my point of view, not knowing what you intended, this looks great! These still turned out really neat looking! It's a great look! This is so pretty and amazing for a first attempt! I have yet to try this technique! I haven't tried this technique yet. Yours is eye catching and fun. Ooh this is cool! It looks tricky!